If you’re one of the 38 million Americans who receives SNAP benefits, you may have woken up on January 20th, 2019 with a surprise: you received an unexpected month’s worth of SNAP benefits. Due to the government shutdown, states issued about $4.5 billion in February SNAP benefits earlier than usual — an impressive technical and operational accomplishment that required an all-hands-on-deck effort from the Department of Agriculture, state agencies, EBT processors, client advocates, and more. Many who have spent their careers working on SNAP quickly identified a challenge: SNAP participants across the country would have nearly two months between deposits, increasing the likelihood of the all-too-familiar empty cupboard towards the end of February. Yet, past research shows that this type of hopeful budgeting is easier said than done. Due to our present-bias, most of us struggle when budgeting a large lump sum. We have a tendency to spend more than we should right after our payday and then have to penny-pinch at the end of our pay period (1). As a result, those who get paid only once a month (a large lump sum) do not budget as well as those who get paid twice a month (2). In our own work with Common Cents Lab, a Duke-affiliated behavioral economics research group, we found that Fresh EBT users, who typically get their benefit deposit once every 30 days, tend to spend about 80% of their benefits within the first 9 days (3). Now, SNAP recipients will face the extremely difficult task of budgeting two months of benefits (an even larger lump sum) over 40–60 days (4). State agencies and partners have worked furiously to raise awareness and encourage SNAP participants to budget. In fact, some SNAP recipients innately understood this basic principle — they want to “pretend” like their February benefits had not actually been deposited early, in order to try to make them last. Working with Wendy, we built a tool designed to make this pretending easier. The tool is simple: Users opts-in by setting the amount they want to hide and for how long. There is no change to what they can actually spend on their card (we have no ability to do that), and we clearly message this so there’s no confusion. 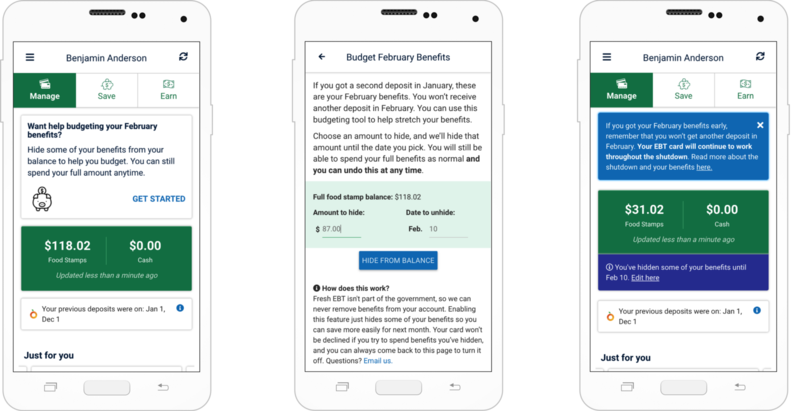 We hope this feature helps some of the 2 million households who use Fresh EBT to manage their benefits through this period of uncertainty. Propel’s mission is to build a stronger social safety net to enable low-income Americans to improve their financial health. Their free app, Fresh EBT, is used by over two million Americans across the country each month. Propel is a venture-backed for-profit company whose supporters include nonprofits, mission-oriented investors, and top-tier venture capitalists: Robin Hood Foundation, Omidyar Network, Andreessen Horowitz, and Kleiner Perkins. Propel is based in Brooklyn, N.Y.
Bodkin, R.G., 1959. Windfall income and consumption. American Economic Review 49(4), 602–614, and Beshears, J. and Milkman, K. 2008. Mental Accounting and Small Windfalls: Evidence from an Online Grocer. Harvard Business School — Working Paper 08–024. Berniell, I. (2016). Waiting for the paycheck: individual and aggregate effects of wage payment. Most states spread out the distribution of benefits over the course of the month. If a participant’s normal monthly deposit date is on the 20th of the month, she receives both her January and February deposit son January 20th and does not receive her next deposit until March 20th, she would go 60 days between deposits.